In 2006, three young leaders began a conversation at the World Economic Forum about polarization across the globe, what divides us and the challenges we all face. Haakon Magnus, crown prince of Norway; John Hope Bryant, CEO and founder of Operation HOPE; and Pekka Himanen, philosopher and professor, reflected as well on the universal desire of humanity to be understood and appreciated, to achieve dreams and develop collective potential. Has the right to pursue their purpose and meaning in life, and to reach their full potential. Deserves to live in societies that provide access to education, health, income and security. Has the responsibility to create the conditions for others to fulfill their potential, acting to strengthen the dignity of others, building a foundation of freedom, justice and peace for this and future generations. Believes that dignity in action means standing up against injustice, intolerance and inequality. 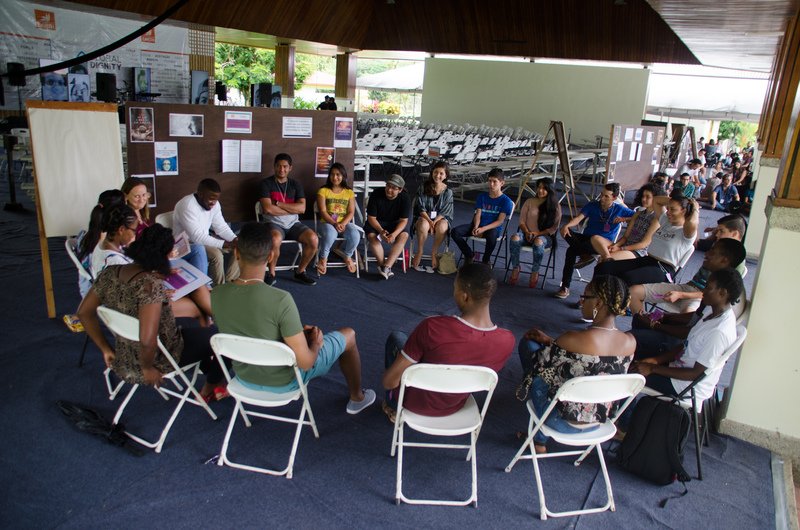 This month’s event marks EARTH University’s second consecutive year of celebrating, bringing together more than 400 participants – EARTH students, faculty and staff members, and youth from a nearby high school – to learn how dignity comes to life through lived experiences. 1. Opening plenary session where the subject was presented. 2. Facilitated small-group discussion and activities. 3. Closing plenary session where participants’ dignity stories were shared. 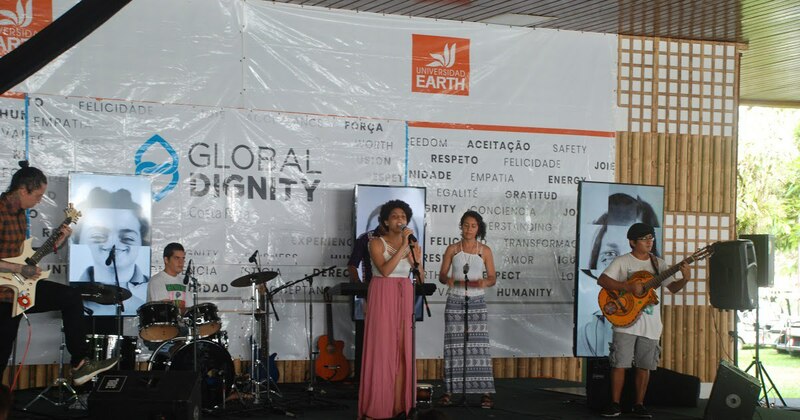 The opening session was kickstarted with an upbeat original song about dignity, performed live by Dasha Montcalm (’20, Costa Rica), Pierre Ansdiere Denis (’21, Haiti), Andrés Charpentier (’20, Costa Rica), Joel Yantalema (’18, Ecuador), David Torres (’18, Ecuador), and Karen Marroquí (’18, Guatemala). The empowering chorus went “Llénate de amor, siente la buena energía, ¡acéptate!” (“Fill yourself with love, feel the good energy, accept yourself!”). Condo then introduced Natalia Vindas as the special guest and keynote speaker. Vindas – a wheelchair user since a transit accident damaged her spine a few years ago – was recently selected to represent Costa Rica in the World Adaptive Surfing Championship this December in La Jolla, California. When off the board, she is the director of accessibility for Plura, a social enterprise advocating for inclusivity along with more work and tourism opportunities for people with disabilities. 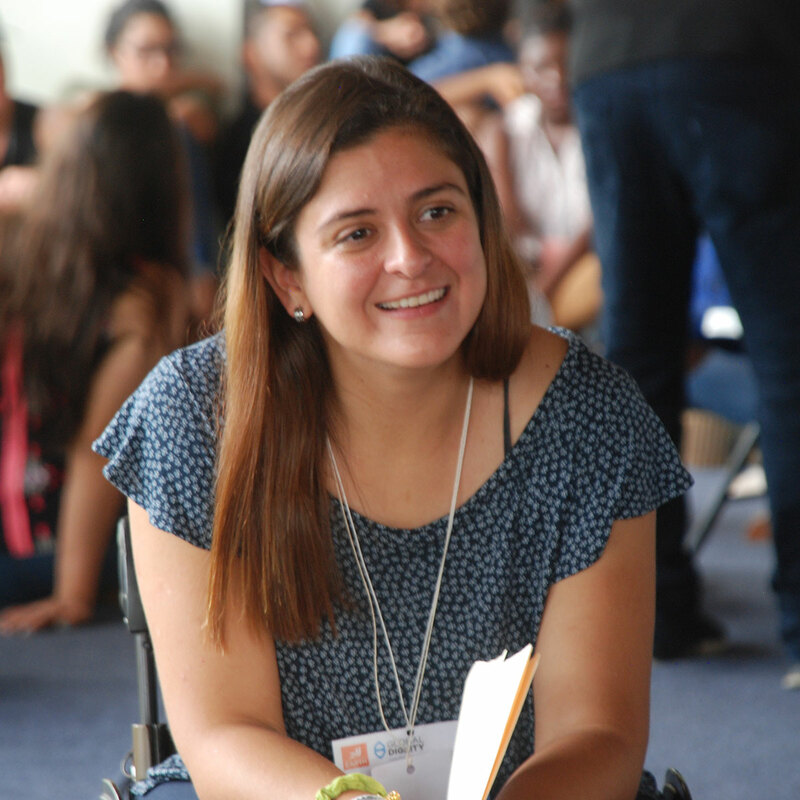 By sharing her story, she motivated participants to pursue their own purpose in life – insisting that sometimes we must reinvent ourselves in order to reach our maximum potential and to help others reach theirs. 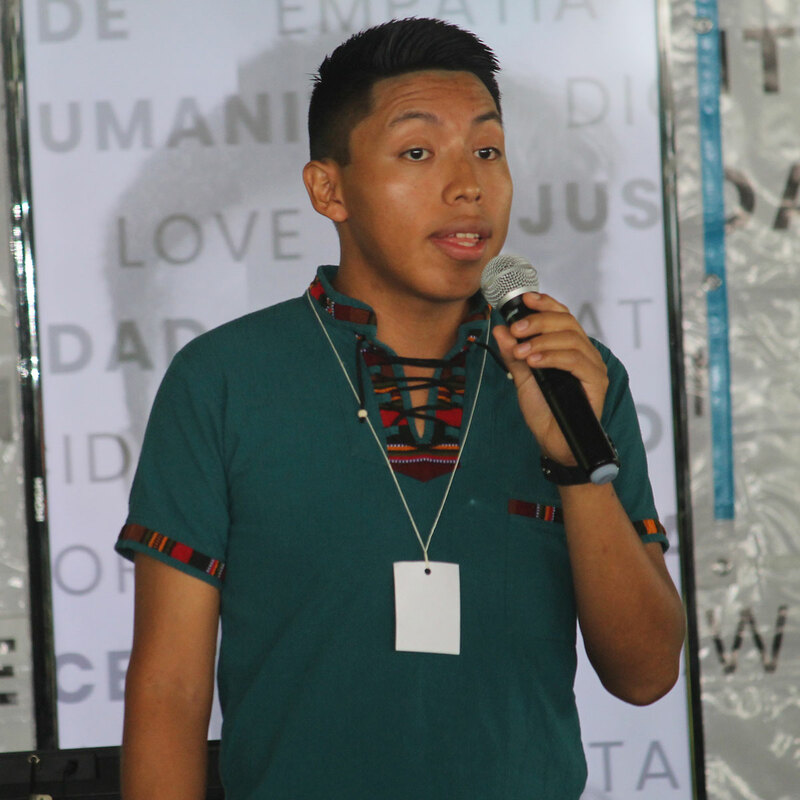 Also during the opening session,Cristian Ixcayau (’18, Guatemala) presented a story of dignity from his life. A well-respected EARTH student leader, Cristian told about a family situation that affected him at 9 years old and how this serves as one of his primary motivators. “I want to make changes in my country, to continue working hard, to build – as EARTH’s mission states – societies that are more prosperous but also dignified,” he said. Facilitation-trained EARTH staff and faculty members guided the participants of each small group through reflective discussions and a search for their own stories of dignity. The facilitators maintained environments of support and confidentiality. Each participant penned a letter to oneself – promising to put values of dignity into action – and sealed it in an envelope. They will receive their letter on Global Dignity Day 2019, where they will have time to reflect on the advancement of their goals and commitment. In the event’s closing session, a handful of participants volunteered their stories of dignity to inspire the congregation. To learn more about Global Dignity Day or to get involved – no matter where you are in the world – visit their official website.